These were the words which the German press used to describe the ensemble’s debut concert in Dresden in the spring of 2012. The meeting between two global stars of the classical guitar and two of the most outstanding protagonists of the acoustic guitar scene was accompanied by enthusiastic appreciation from both critics and audience alike. It was therefore no surprise that their debut was followed by invitations to festivals around the world, which include major festivals in Scandinavia and Germany (Bergen Music Festival, MDR Musiksommer) as well as other prestigious events in Austria, Switzerland, India and South America. Fellow musicians such as Klezmer legend Giora Feidman have also been quick to voice their admiration for their music. “DANZA” would be a fitting title for the quartet’s current program, as it combines the intense, virtuoso, spirited music of South America and Europe to take listeners on a thrilling musical journey. 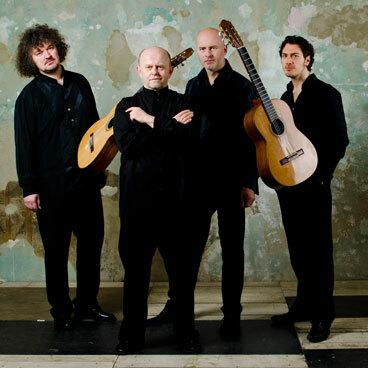 Unique interpretations of pieces by Astor Piazzolla and the dances of the Paraguayan guitar legend Agustín Barrios mingle with the melodious compositions of the masterly Nicolo Paganini and the complex rhythms of Balkan dances (Dusan Bogdanovic). Works by Thomas Fellow and Reentko also feature, and present concert music, world music and jazz in a contemporary embrace. These four musicians – each of them a renowned performer in their own right – have set themselves the task of blending the instrument’s concert tradition with the expressive, dynamic sounds of modern music. 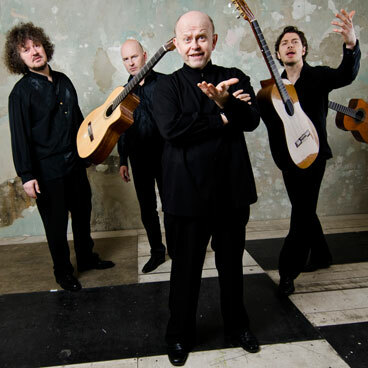 The European Guitar Quartet – a summit of guitar music. ZORAN DUKIC is one of the most distinguished classical guitarists of our time. His concert performances, as a soloist as well as with an orchestra, leave long-lasting impressions on both audiences and critics. At his “tour de force” competition years he won more competitions than any other guitarist in the world. Presently he leads major classes at a number of European colleges, including the Universities of Barcelona (Spain) and The Hague (Netherlands), where he could establish one of the most successful soloist classes for this instrument worldwide. Born in Croatia, he is now living in Barcelona – but in fact touring almost constantly through the world, playing concerts and giving masterclasses at every major guitar festival. PAVEL STEIDL is a true legend of the classical guitar. Born in Rakovnik (Czech Republic), he decided to emigrate to Netherlands in 1987, where he lived for several years. Since he won the first prize at the Radio France International Competition in Paris in 1982, he has become one of the most widely celebrated soloists of his generation. His unrivaled ability to create sounds on the guitar make his interpretations a class of its own. But Pavel Steidl also composes himself and his own compositions are often played on his concerts. As a soloist he travelled more than 40 countries all over the world – the USA and Canada as well as China, India and Japan and South and Central America as well as almost every European country. Dresden” (Germany), the artistic direction of the "European Guitar Award" and for his work as the author of an educational standard work for guitar as an accompanying instrument ("FELLOW GUITAR BOOK"/ Schott Music). Born in Leipzig (Germany), he won several prizes at international competitions for classical guitar and played concerts in India, South America and the USA. His Duo “Friend ‘n Fellow” ranks after more than 1500 concerts worldwide (with legends such as Ray Charles, Al Jarreau and Luther Allison) as one of the leading projects of this kind. REENTKO is an awarded and highly acclaimed guitarist and composer. His music is a distinctive blend of unorthodox, self-developed percussive playing techniques covering a wide range of styles. He is one of the few guitarists who is as much in demand in the classical world as in the pop and world music scenes. He wrote music for artists of the Cirque du Soleil and the Semperoper Ballet. Currently he is also the guitarist of the Klezmer icon Giora Feidman. Born in Bad Gandersheim (Germany), he moved to Dresden to study “Acoustic Guitar” under Prof. Thomas Fellow. 2007 saw him become one of Fellow’s fellow lecturer. Performances have so far taken Reentko to various European concert halls and as far away as South Korea, the Arabic Emirates and China.